Last night, Fintech Aviv, a Tel Aviv based fintech networking meetup hosted by CurrencyTransfer devoted the evening to the Bitcoin sector. 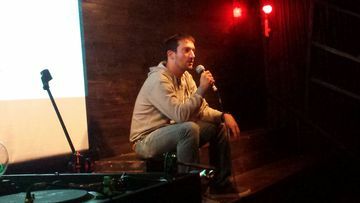 Similar to previous meetups, the evening included demos from startups and a keynote speaker. Demoing were representatives from Bitcoin Authenticator, Bitcoin Rated, Algobit and Polycoin (more on their presentations). Beginning the evening was a keynote from Eden Shochat from venture capital firm Aleph. His talk centered on the opportunities involved with bitcoins and how it relates to their overall fintech industry. Shochat explained that the internet has caused disruption in virtually every industry, with the travel sector the first to really be affected. However, highly regulated industries are taking longer to be disrupted. But more regulation means greater inefficiencies and potential opportunities for innovation. In this regard, Shochat specifically mentioned the financial industry. As for examples of regulation and inefficiencies, Shochat cited that the remittance market is filled with fees since it caters to unbanked customers. As they don’t fall under a bank’s typical customer base, existing financial infrastructure ignores the unbanked. Elsewhere, he noted that in Europe and much of the world, bank wires are operated using the Swift agency. However, they don’t provide settlelement, which leads to lost funds among transfers sent between the largest banks in the world. Shochat noted that internet disrupters tend to need to battle existing regulation. He brought Uber and Airbnb as examples, noting that of the billions of dollars Uber has raised, much of it is going towards funding legal battles they have in both existing and potential markets. However, Shochat explained that despite the friction against Uber, in their launch city of San Francisco, even though they have achieved $400 million of revenue in the region, the local taxi market in the city has remained untouched at around $135 million. This means that, rather than disrupting taxis, Uber has become an alternative to driving. Shochat explained that in the taxi or hotel industry where an Uber or Airbnb can enter a market illegally, their potential punishment is limited to paying fines until they either exit the market or prevail in court to change regulation. However, this contrasts the financial industry where punishments often include jail time or seizing of funds. The bigger picture is that the existing regulation, which limits the use cases of fintech and bitcoin, has caused the disruption opportunity to remain huge. As a result, the question is, who can combat this regulation problem to arrive at the opportunity referred to by Shochat and many others and be the Uber of the bitcoin industry?